Set the size of the menu in percent, pixels, or other units. 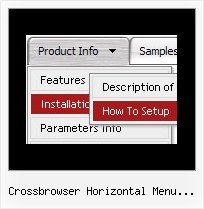 This menu may have a relative (it can be inserted into the table, for example) or absolute position . You can specify a time for delays in showing or hiding of a submenu. Use special prefixes for image paths and links to make paths absolute. Q: I intend to purchase a copy of Deluxe menu where I will be using tree menu for a project. I have created the tree describing the menu and copied the data.Files folder, data.js file to the area where the HTML page is and pasted the relevant text into html file. You can use "Export to HTML" function in Deluxe Tuner. Q: Does your xml drop down menu support Arabic language fonts? Q: I'm fairly new to HTML and Java. I'm using your popup window html, (its great) but do notknow how to use the "ID object" function. I'm using Frontpage as my HTML editor. The only way I can figure out how to give "a line of text" or a "Graphic" and ID is to create a "Layer". That creates an (ID) in the HTML script. But I still cannot get the pop up to work when clicking the object. How is the best way to create an object ID that will all Deluxe pop-up to recognize it? Can I have two separate pop-up within the same html page? One last thing...Can I create a pop up that fly's out after 10 seconds, and within that fly out have a link that opens another pop up with important info in it using the iframe feature? This sound like novice questions, but that's me! So, in the Deluxe Tuner you should enter 'open_popup' object ID in the onMouseOver,onClick or onMouseOut fields. Actually you can assign id to any object on your page manually. Switch to 'Code' mode andadd id="open_popup" for <a>, <div>, <img> ... tags. > Can I have two separate pop-up within the same html page? You can add as many popups as you want. > Can I create a popup window html that fly's out after 10 secondsCreate popup window and set openAfter=10 parameter to it. You can find this parameter in'Actions' section. > and within> that fly out have a link that opens another pop up with important info in it using the iframe feature?Use HTML content as window content. Set winContent parameter in 'Common' section. Use another winID (first parameter) than you have in your data file if you don't want to close 1-st popup window or use thesame winID=win if you want to close 1-st popup. contentType - set this parameter to iframe. Q: Is there a way to get rid of the spacing on the main menu?